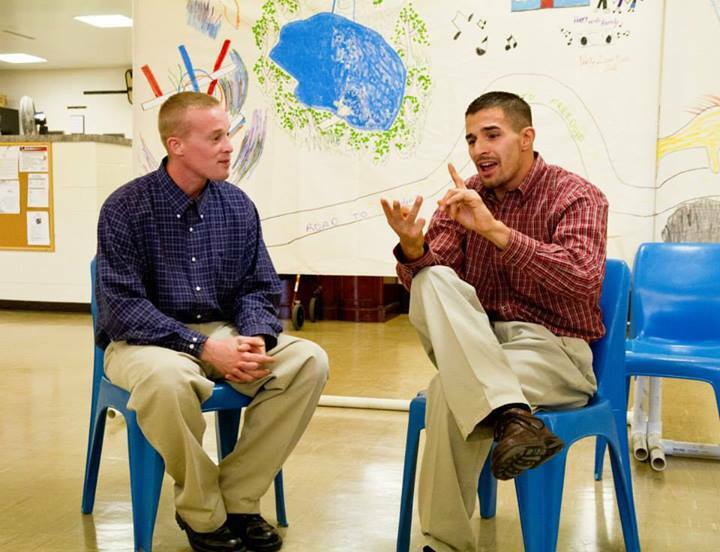 Helping current and former prisoners enrich their lives through theatre. During my incarceration, I have searched for certain feelings to get me through my time. More times than not I have ended up disappointed only because these feelings when I fain them are short lived. Some of the feelings I search for are feelings of normalcy, freedom, and being loved. Theatre has the power to change lives. This is particularly evident when producing theatre in a prison environment. The nature of the venue encourages what many thrifty theatre companies must always do – accomplish the impossible – with a tiny budget and devoted individuals. I ended up at PPA due to being a resident in the XPLOR program. XPLOR is a 10 month long social justice residency program and is sponsored by the National Benevolent Association (NBA) through the Christian Church (Disciples of Christ). After applying and being accepted into the program, residents are placed at a nonprofit internship. I was placed at PPA and the rest is history! Join us for a Première Movie Showing of a NEW DOCUMENTARY about Prison Performing Arts at the Chase Park Plaza! Friday, April 12th @ 7:00 p.m. DOORS OPEN @ 6:30 p.m.
Lisa's new documentary Prison Performing Arts: VOICES WITHIN, presents portions of the workshop for PPA’s first commissioned play Run-On Sentence by Stacie Lents at the Women’s Prison in Vandalia, MO. The film includes interviews with PPA Founder Agnes Wilcox, Playwright Stacie Lents, and PPA Artistic Director Christopher Limber. We hear firsthand the stories of many of the Vandalia women and many of their mothers, sisters, and children. The emerging subject of this new documentary is the transformational power creating art has for incarcerated individuals offered through Prison Performing Arts. Come and see a special exclusive preview cutting of this new and powerful film April 12 at Chase Park Plaza. Very limited seating is available - contact chris.limber@prisonartsstl.org after March 15th to reserve your spot. Ms. Boyd recently won "Best Director" from the St. Louis Film Festival in 2018 for her newest documentary "An American Tragedy" about murderer Jeff Ferguson's crime and redemption. “An American Tragedy” movingly and subtly addresses issues related to capital punishment and criminal rehabilitation. Join us for "We Know What We Are, But Not What We May Be: Restorative Circles of Reconciliation"
Saturday, September 7, 2019, 9:30 a.m. – 5:30 p.m.
"Masks-of-deception . . . peeled . . . and . . . checked . . . at the portal-of-resignation . . . false-faces-forged with the pain-of-inhumanity . . . received . . . and . . . passed on . . . and . . . received . . . and . . . passed on. . . a never-ending-cycle-of-circular-abuse . . . Come and learn about creating The Circle Of Trust." In Curt's life’s work with the incarcerated, it has been his mission to create an alternative to this circular abuse, to inspire an oppositional circle – one of hope and healing – what he calls: The Circle Of Trust. The Circle Of Trust offers hope and healing in a punishing world of correction designed to strip human beings of identity and belief in humanity - both theirs and others. Call 314-289-4190 for more information, or email chris.limber@prisonartsstl.org. 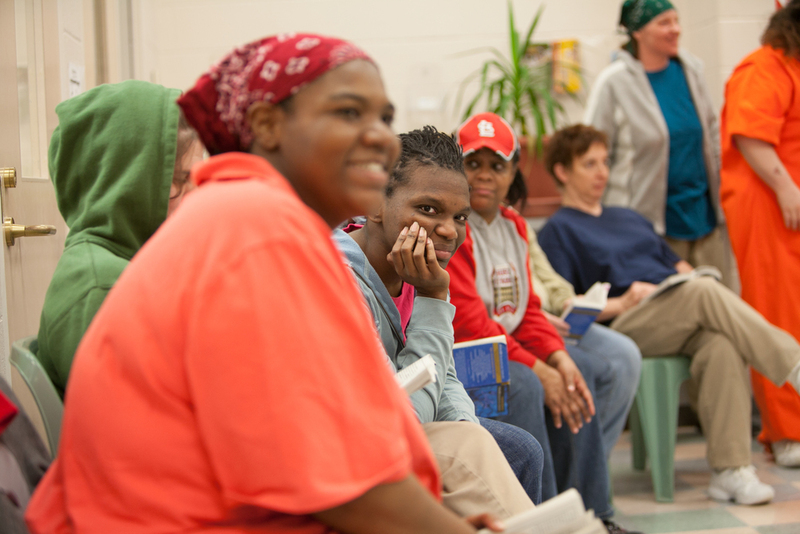 Top photo: premiere of Run-On Sentence at Women's Eastern Reception, Diagnostic and Correctional Center. Bottom photo: production of Run-On Sentence by SATE. Run-On Sentence, the play PPA commissioned and first developed as part of our New Plays Initiative was nominated by the St. Louis Theatre Circle Awards for BEST NEW PLAY. Everyone at Prison Performing Arts is so excited to announce BIG CHANGES coming to our website. Over the next several months, we'll be cataloging past PPA performances, so that you can view photos, videos, programs, reviews, and other related media from every past PPA performance. First and foremost, uploading this media to our website will offer families of our incarcerated and reentering constituents easy and continued access to pictures, programs and videos of in-prison performances featuring their family members. Additionally, we are building several additional new pages that will showcase the exciting changes that have come to our organization over the last few years. These include, for example, PPA's New Play's Initiative, the new look of our programs, artwork, and updated branding. Adding these show archives and programmatic additions with accompanying videos, programs, artwork, production photos, and any recent media from past PPA performances will celebrate and highlight the innovation and on-going exceptional quality commitment of PPA's seasonal artistic work. Thank you for continuing to follow and support PPA's exciting journey. We're looking forward to painting a more comprehensive and quickly-accessible picture of our work and impact with these new web additions. In Fall 2018, the PPA Alumni Company began work on writing a new play, Kept Away, designed for family audiences. Kept Away has been commissioned by PPA's long-time collaborator the St. Louis Public Library. This original production is being written by the company members about incarcerated parents and their struggle to keep connected to their family and children outside of prison. It will open at the Central Library Downtown Tour through 5 or more city public libraries. It is one of four plays that will become available for booking by the PPA Alumni Company in the St. Louis Community throughout the year. Kept Away will offer insight into incarceration, rehabilitation, and successful re-entry from the standpoint of parenthood. The play allows the Alumni artists to add a depth of understanding to their community about formerly incarcerated individuals and reclaiming family ties upon re-entry. It also supports their continuing efforts as a returning citizen. By studying, rehearsing, and creating new plays and original characters, the returning citizens of the Alumni Company — all men and women who formerly worked with PPA while incarcerated — continue to grow to understand themselves through contributing artistically to the world. By exploring literature and poetry in developing new dramatic productions for St. Louis audiences, the Alumni Company members articulate their deepest thoughts and discovered ideas. These continued theatrical contributions to the world — for families, public audiences, and most importantly, for the actors themselves — give voice and image to individuals who often have never before had the opportunity to publicly share their gifts (indeed, their identity) within a performance context that allows them to be heard, understood and appreciated. Through new and exciting performances by the Alumni Company, both joy and community are created. Kept Away will premier in the Spring of 2019. The project is supported and directed by Christopher Limber, Artistic Director for PPA, and Aarya Locker, Special Events Director for the St. Louis Public Library. Joining them is the playwright, John Wolbers, who will add dramaturgical insight and additional material. I hope this letter finds you well. I am writing to invite you to Prison Performing Art’s Annual Fundraising Event. Prison Performing Arts (PPA) is a St. Louis, Missouri-based non-profit that goes into prisons and makes plays with incarcerated peoples. I was moved by your TED talks, We gotta get outta this place and Institutions That Change You. Thank you for those. I am one of the 60 million who have been on the wrong side of the fence. I have learned to deal with people from all walks of life and also fallen into a homogenous group, in an effort to make my time feel short. I have done this on the outside as well. Though it was never so obvious. Post-incarceration, I consider myself an activist, like you. I feel like we have lost the purpose of incarceration: rehabilitation. To the contrary, my experience was one that promoted closed-mindedness. This was changed by Prison Performing Arts. PPA gives prisoners in Missouri a better chance of opening their minds and moving toward a productive, happy life. Participants are never turned away. All who want to (and maintain a record of good behavior) are welcomed and taught. People across groups spend time working on memorizing lines and analyzing text. This moves people from social groups divided racially to ones where they share a similar interest. That interest is learning and self-improvement, subtly disguised as tragedy, comedy or creative writing. Participants delve into the great unknown together and when they are released, many of them continue together as part of the Alumni Company. I’ve seen amazing things come out of these small troupes of folks. We’d like your help to amplify the signal. It would be an honor if you considered attending our annual fundraiser. Thursday, September 27, 2018. I am writing you as a fellow post-incarcerated citizen. I apologize for bringing up what might have been a dark time. It was for me, the last thing I wanted to think about was time. I was overwhelmed by how much time was left. Couldn’t even look at clocks. This avoidance meant I didn’t use my time well, to reflect on decisions and focus on changing for the better. I’m lucky to even see that. Many offenders feel they have no reason to change. They may not be getting out any time soon, or at all. These people are why Prison Performing Arts (PPA) exists. The programming from PPA provides hope for hundreds of the offenders in Missouri prisons. PPA gives prisoners an opportunity to live in the moment, even while inside. Rehearsals are times to look forward to, and performances are times to work towards. Participants get practice speaking with confidence and holding eye contact (useful for job interviews when they return to the outside). Prison Performing Arts gives prisoners a chance to participate in something bigger than themselves. In a way it’s just a play, but for participants, it is their hope. There are good and bad days in prison, just as there are for everyone, in any walk of life. I wanted to invite you to attend our 2018 annual fundraiser to provide good-day-opportunities for people. I feel like you know what it is like to be counting down. I feel like you get what it means that inmate involvement in Prison Performing Arts programs reduces recidivism and racial tension. It’s a good thing. It would be an honor if you considered attending our annual fundraiser. I realize it’s a large ask. Rachel Tibbetts has been with Prison Performing Arts for nine years. As Director of Education and newly appointed Associate Artistic Director, she develops all of PPA's programs at the St. Louis City Juvenile Detention Center and Hogan Street Regional Youth Center and directs the organization's Alumni Theatre Company. Fourteen years ago, Rachel was hired as an intern fresh out of college to work as an education associate with the Delaware Theatre Company in Wilmington. On her very first day, she was asked to accompany the director to assist teaching a class in a juvenile correctional facility. From that day forward she was hooked. Rachel has dedicated much of her professional career to developing and administrating PPA's Learning through the Arts programs at the St. Louis City Juvenile Detention Center. Currently classes include "Writing like a Pro" with Sister Barbara Schlatter, "Ballet" with Elizabeth Herring and “Sidewalk Chalk Writers” with Valencia Tims. Rachel develops the classes and hires teachers who are adaptable and can improvise. The nature of these institutions demands flexibility and open-mindedness. Rachel also teaches at Hogan Street Regional Youth Center and for the first time has been asked to direct the students in a production of "To Kill a Mockingbird." When asked about a particular moment that stands out from her programs, Rachel recalled "the courage of a young man who participated in the Hip Hop Poetry Project in 2007. He wrote a beautiful piece, but didn’t want to read it because he stuttered. But he ended up reading it during our performance. He realized that his voice mattered no matter what and what he wrote needed to be read and heard." Rachel also directs PPA's Alumni Theatre Company, which is made up of former inmates now living in St Louis, most of whom had worked with PPA while incarcerated. The group meets once a week for training, rehearsal and support. It is difficult and rewarding work that can help people reshape their lives. "I’ve been surrounded by art my whole life," Rachel says. "My mom is an artist and plays the piano. My parents started taking me to plays and ballet before I even remember being able to talk. Art has always been a part of who I am and it has taught me more about justice, empathy, and caring than anything else — well, besides my parents and friend family, of course." Alongside her full-time work with PPA, Rachel is incredibly busy, She is also a founding member of Slightly Askew Theatre Company (SATE), where she is an actor, director and producer. SATE was founded on the principles of The Viewpoints, a technique of composition that provides a vocabulary for thinking about and acting upon movement and gesture. Originally developed in the 1970s by choreographer Mary Overlie as a method of movement improvisation, The Viewpoints theory was adapted for stage acting by directors Anne Bogart and Tina Landau. Six Viewpoints (space, story, time, emotion, movement, and shape) are considered to be a logical way to create staging with actors. Whether Rachel is igniting the human urge for expression in her students and teachers or creating an atmosphere where her youth are not afraid to try things and "fail forward," she is constantly making choices and taking chances. Her dedication to art, creativity and experimentation informs her teaching and leadership style. "Art gave me a voice when I was a shy, often afraid young girl," Rachel recalls. "I’ve recognized the importance of art in my own life and I feel that it’s crucial that all young people have access to the arts so that they can discover their own voice and discover that there’s a whole world out there for them that they can dive into through participation in the arts. Self-worth is an often overlooked, taken-for-granted thing. But it’s so important. You have to feel that you have value in order to make good decisions." Limber (Front Row, Left), Co-Directing PPA's "Coming Home"
November 1, 2014, St. Louis, MO — The Board of Directors of Prison Performing Arts (PPA), the multi-discipline literacy and performing arts organization that leverages the power of art for personal transformation, today announced the appointment of Christopher Limber as Interim Artistic Director. Limber will succeed PPA’s Founder and Artistic Director, Agnes Wilcox, who will retire from the organization after two decades at the helm. Limber and Wilcox, who have been colleagues and collaborators in the St. Louis theater world for many years, will work together during a transition period during early 2015, with Limber taking the leadership role in March of that year. Read a St. Louis Post-Dispatch feature about this transition. Limber is a professional director and actor, a published playwright, poet and composer/lyricist, and has contributed educationally or artistically to many major St. Louis arts institutions, including Prison Performing Arts — most recently co-directing Coming Home at the Missouri Eastern Correctional Center in Pacific, Missouri — The Rep, Opera Theatre, COCA, and Shakespeare Festival St. Louis. Limber has taught actors of all ages at every major educational institution in St. Louis, including COCA, Saint Louis University, University of Missouri in St. Louis, Washington University in St. Louis, and Southern Illinois University – Edwardsville. He has also taught workshops and teacher training at more than 100 middle, high and elementary schools throughout Missouri and Illinois A proud 35-year member of the Actors’ Equity Association and the Dramatists’ Guild, Limber studied English literature and Shakespeare at Exeter College – University of Oxford, England, holds a BFA in Acting from the State University of New York at Purchase, and is a graduate of the Community Artists Training offered through the Regional Arts Commission in St. Louis. As part of PPA's strategic growth, Rachel Tibbetts, PPA’s longtime Director of Education, will become Associate Artistic Director on January 1. She and Limber will work together to take PPA forward, with equal emphasis on our programs for youth and adults. Wilcox departs PPA having brought local and national acclaim to the organization and its performers. She plans to continue her work in museums, creating performances with former inmates and homeless veterans. She and a colleague are completing a book describing their theory and methodology of working with disenfranchised and marginalized populations. Wilcox will continue to lecture at colleges and universities across the U.S about the importance of the arts in corrections. To schedule an interview or request additional information, please contact Shelby Partridge at Shelby@prisonartsstl.org or (314) 289-4191. Prison Performing Arts is a 22-year-old, multi-discipline, literacy and performing arts organization that leverages the power of art for personal transformation. PPA's Adult Programs involve incarcerated men and women at the Northeastern Correctional Center (NECC) in Bowling Green, MO, the Women's Eastern Reception, Diagnostic and Correctional Center (WERDCC) in Vandalia, MO, and the Missouri Eastern Correctional Center (MECC) in Pacific, MO. 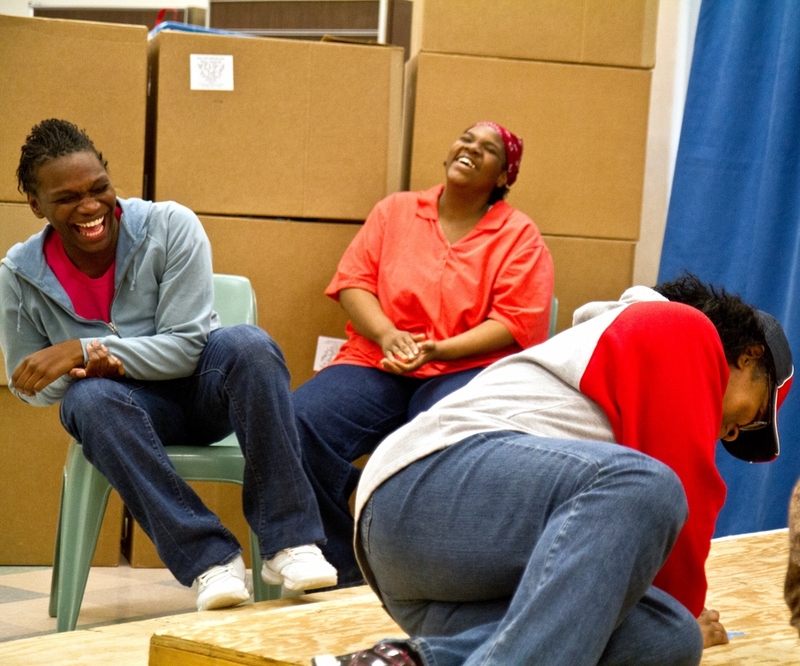 Led by trained theater professionals, program participants write, rehearse, and perform theatre as a way to inspire curiosity, strive for excellence, and develop teamwork and communications skills necessary for successful re-entry into society. PPA’s Alumni Theatre Program offers those performers who have re-entered society with a supportive and productive way to continue honing their skills, perform for the community, connect to their fellow actors, and earn a modest but essential wage. The organization’s Youth Education Program provides an empowering outlet for productive creativity to kids held at the St. Louis City Juvenile Detention Center and the Hogan Street Regional Youth Center. In all of its programs, PPA nurtures talent, inspires positive personal change, and presents unforgettable experiences for our St. Louis audiences. Several years ago, when I was Company Manager for the Shakespeare Festival St Louis, I thought that Forest Park during the festival season would be a wonderful place for PPA's Alumni company to perform. On June 4th and June 11th we had that opportunity, and I hope to help make it happen again and again for years to come. The green show stage is an intimate setting that welcomes students and non-professionals, and gives them a platform (quite literally) to share themselves with the community, reciting Shakespeare's words. It is a free, inviting, culturally charged atmosphere that is casual, welcoming and accepting. I sometimes wonder: what is the benefit of our Alumni performances? Is it an opportunity to spread the word about our organization’s mission? Is it a chance for our participants to "act" in front of an audience? Or is it an invitation to be a part of each other’s worlds and aspirations? On the surface we are disparate and alien from one another, some would say worlds apart, yet we all find ourselves searching for common ground that supports our humanity. Is it as simple as: I see you and you see me? Or does a soliloquy or sonnet gives us space to consider who is there between the lines, between what is spoken and unspoken? With each breath and intention we receive the power of the written word spoken. We witness the marriage of voices, filled with longing to understand and be understood. I've seen a few shows recently with Prison Performing Arts, and I've been nothing but impressed. I come in not knowing what I'm going to encounter, and I walk out always feeling like I can take on the world. Theatre is a great way to gain an understanding of others around you, as well as yourself, and I have thanked PPA many times for challenging me to understand others in a way I never imagined. PPA's production of Going Home in the Humanities Festival last month offered that same kind of discovery. Walking into The Stage at KDHX, I figured the play would be one that was like any usual production - beginning, middle, end, maybe with a Q&A. What happened, however, was quite different. Before my eyes, I saw qualities that have been sadly lacking in some professional performances today: sincerity and enthusiasm. No one was announcing to me who they were, no one trying to prove to me that they were some kind of professional. Instead, each person was up there doing what theatre is supposed to do in the first place: tell a story. And what a story did they tell! 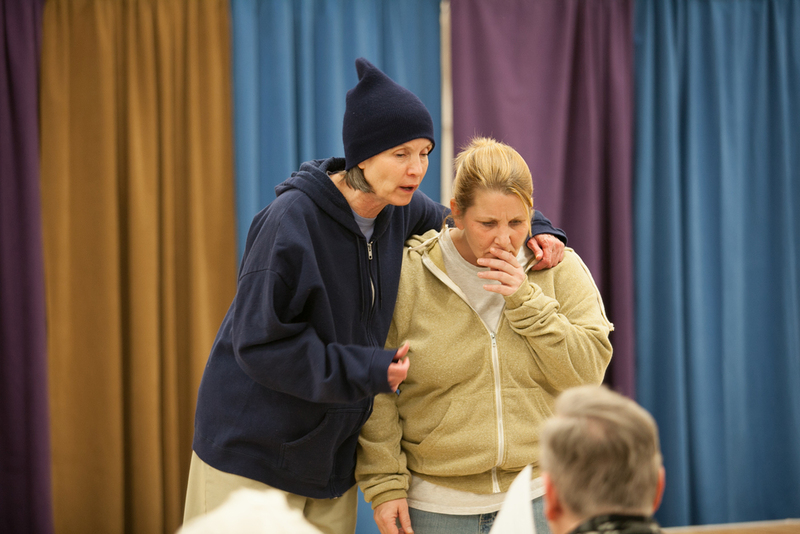 Through humor and reflection, PPA's Alumni Theatre Company shared with us the difficulty adjusting to everyday life after returning home from prison. It made me realize how much I take for granted: the simple handshake of trust between two people, the look of approval someone gives when hiring one for a job, and the ability to grow as a person and grow with others as a team in this big, crazy world. Each scene presented a unique perspective and opened new doors to my understanding. There is another important lesson I learned from Going Home - everyone has the capability to change. Sometimes the person you thought you were is not always the person you really are or who you can become. That was one of the biggest realizations for me. I may think one way now, but I may have a different view on life in the next five to ten years. And if I want to change for the better, or take a brand new path in life, who is to say I can't? At the end of the day, no matter what I do in life, what is the most important is that I keep one path near and close to my heart: the path going home. It was really moving to be a part of the 10 year celebration and share the stage for a brief moment with the kids as a "performer" after being in the role of "staff" for so long. I've performed outside of the JDC setting many times, but it was special to read one of our kid's poems knowing what they go through before, during and after their stay with us and how we ask them to crank it out on a page while they are here during this project. For some of them, they are writing, reading and performing something for the first time ever in this program. The emotion and energy are always two things that audience members say they are blown away by each year. Who wouldn't be - as the kids tell us true tales of love, hate, abuse, struggle, pain, pride and success. I'll never forget James' mom standing up and just bursting with emotion and pride as her son read "Black Woman" to the crowd in 2011. Secretly (or maybe not?) I have held back a tear on many occasions at a Hip Hop performance, but that was one that probably squeezed out. Or how about Saturday night when Rachel read Miko's poem and then triumphantly reported that he had accomplished his goal of going to college just as he stated in his 2012 poem "Shift in Spirit." Powerful. We always talk as a team during the week about how the flow of the project will go with movement of kids in and out of workshops, how to structure the classes and show, and planning our diligent efforts to get kids to re-engage and get back in there. Most of the time it works, sometimes not, but those are our roles reaching these young men and women where they are while they are with us. We have such an experienced team of teaching artists now that the teamwork needed to pull off this huge task in just a week's time just comes naturally. You can see it in the everyday operation though as each person takes care of his/her part. That speaks volumes to the curriculum that we have for the kids and the seasoning of our teaching artists who want to come back each year and be part of this. Of course, the superstar of this whole production has become PPA's Rachel Tibbetts. She does not get enough credit. I was touched to see the youth explode into a cheer when her name was mentioned at the end of the show. She deserves every bit of that including the impromptu hugs from four kids. When you have that kind of support behind you, you aren't afraid to bare your heart and soul to a room full of strangers, your parents, peers, and the staff who are in charge of you every day. That kind of audience would intimidate anyone - but these kids, untrained and full of talent - find that courage thanks to Rachel and our teaching artists and staff every single year. I'm not really sure of any Detention Center that has a partnership like what we have with PPA through the Hip Hop Project. We are very lucky. They go above and beyond to ensure that our kids get the best arts experience they can while they are under our care. It's a special thing to know this program is alive and well right here in St. Louis. To see our youth have such a success after a goal has been set before them and a week of hard work is behind them is an incredible thing to witness. I am truly grateful to be a part. The Vandalia Women’s Theatre is a resourceful group with an intrepid leader: cast members may disappear, actors may have to take on roles just days before the performance, weather and lock-downs may interfere with rehearsals, and hundreds of lines of Shakespeare’s verse may stump even the most willing actor—but the show must go on, and does—powerfully and inspiringly. 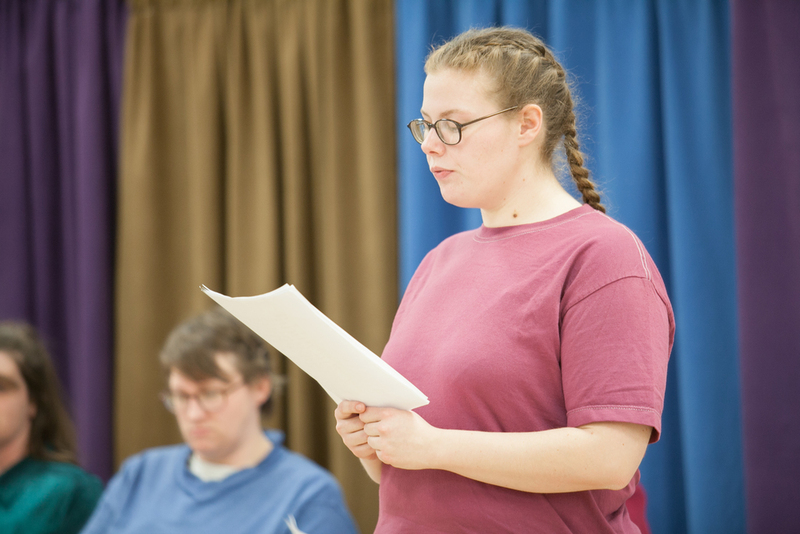 The actors form an authentic “troupe.” For example, “Cassius” (Nikki) who had reluctantly taken on her enormous role just a few days before, and forced to read from her script, did so with understanding and clear diction. Her fellow actors offered her support by carrying their scripts, (though none needed to consult them as they moved and spoke with confidence). One actor and poet, new to the troupe and initially head-duckingly shy, read her poetry and responded to the Q and A with visibly increasing confidence and enjoyment. 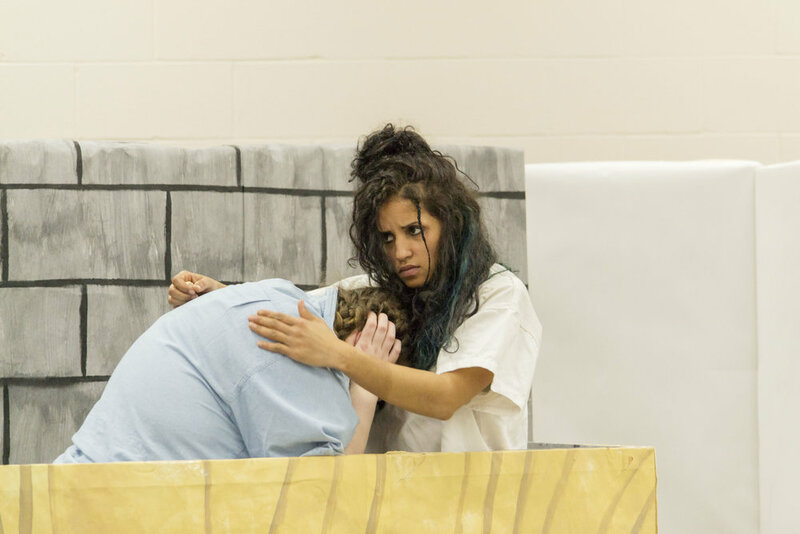 What we witnessed that evening was a meaningful portrayal of Cassius’ treachery and Brutus’ self-deception, inventively set in prison and performed authentically by women who are all too familiar with treacherous gossip. But more than that, we witnessed the wonder of personal transformation, connection, pride, and—remarkably, given the surroundings—joy. In addition, the poets' work was heart-stopping last evening. Agnes Wilcox must be teaching the heck out of that poetry class. PPA's Conversation Series kickoff at Parker's Table January 14th was a delight to attend with some 20-25 fellow donors. Following Agnes' introduction, Post-Dispatch columnist Bill McClellan regaled PPA donors for just shy of an hour with colorful stories from his decades on the front lines of city newspaper reporting, relating it all to the upcoming men's production of Act III of The Front Page at Bowling Green. Having worked the crime beat, McClellan recounted times when individual reporters and police officers cooperated, or not, over the years; how the relationship between law enforcement and local news reporters has shifted over the decades, including the impact of the 24 hour news cycle and rise of new media; and his thoughts about what's next for the news industry. To wind up, PPA Artistic Director Agnes Wilcox lead a Q&A in which McClellan entertained a range of questions from the audience. He plans to attend the Front Page performance. After hearing him at the event, I hope we will get to hear his thoughts on that production. Another real treat at the event: PPA Board member and Alumni Theatre Company actor Edgar Evans offered a reading from Hamlet. Parker's Table was a great choice of venue for the event, gracious and intimate, with attentive staff and superb central location off Clayton Rd. Gourmet nibbles and a short list of red and white wine offerings hand-picked by owner Jon Parker were very popular. To cap off a fine evening, we left with a couple bottles (as did several others), and a bar of Patric ginger chocolate, and fully intend to visit PT again very soon for more. As for PPA's Conversation Series, be on the lookout for the second installment this spring. You won't be disappointed. Prison Performing Arts is pleased to announce the election of three new members of its Board of Directors and Board Executive Committee: Steve Mastin, Tara Nealey, and Karen Werner. "PPA has put great effort in the last year in developing and strengthening our staff and Board," said Winston Calvert, Board Chair. "With the election of Steve, Tara, and Karen — each one bringing unique talents and a shared passion for PPA's mission — we are well-positioned for a very successful 2014." Steve has more than seven years of experience as a Chief Financial Officer, with particular expertise in designing consumer-finance programs and crafting turn-around strategies and plans. The former CFO of St. Louis-based NFP, Steve serves as a Board Member, Executive Committee member, and Treasurer for SMOTJ and as a Board Member for the Center for Head Injury Services. A registered patent attorney specializing in life sciences technologies, Tara is a shareholder in the Science and Technology Practice group in the St. Louis office of Polsinelli PC. She holds a Ph.D. in Physiology (Neuroscience) from the University of Rochester School of Medicine. Tara has served for more than four years on the Creve Coeur City Council, contributing as a member for Ward II and a liaison to and member of the City Employee Pension Board. She has provided pro bono representation for women seeking restraining orders against domestic abusers, and she has served as pro bono guardian ad litem representing minors whose parents or guardians sought orders of protection on their behalf. A conservatory-trained actor, Karen has for years served as a Teaching Artist for a variety or arts organizations, including Shakespeare Festival St. louis, COCA, and The Disability Project. Her belief in the transformative power of art — and that human development can benefit from drama education and sensory awareness — led her to PPA. Beyond theatre and her community commitments, Karen is a somatic practitioner and Doula in private practice. What I remembered most were the smiles. Wide. Genuine. Infectious. 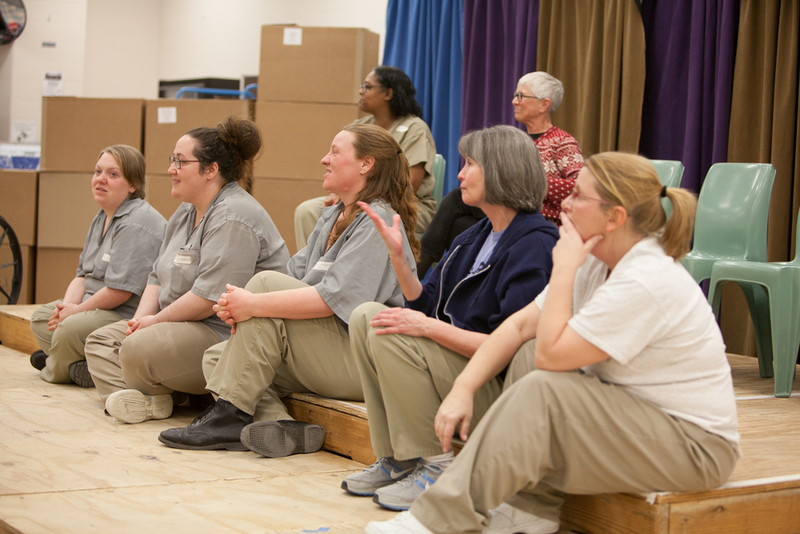 I was recently driving home from the prison in Pacific, having just been wow'd and warmed by Going Home: The Journey to Reentry, written by The Theatre Company of the Missouri Eastern Correctional Center. Heading back east on 44, I was of course struck by the consequential seriousness of the place, but also, more surprisingly, by the laughter I'd heard. Not trivial laughter — but the kind used to confront regret and venture hope. I joined PPA's Board a year ago, and while I've been able to take in several Alumni Theatre Company performances, this was the first show I was able to attend within one of the correctional facilities. I anticipated a bleaker scene. What I found were a dozen dynamic, self-aware, funny and emotionally honest men, who'd been spending many hours in recent weeks rehearsing the show, developed through their own improvisations and experiences. They were now rightly proud to be performing. In scenes such as "The Visiting Room," "Fantasy Interview," and "Reentry," the actors explored the world that awaits them when they're released: the expectations from families; the assumptions from potential bosses; the temptations; the promises (made to themselves and to us). There were original songs, too, as well as a series of haiku, which the actors had written inspired by photographs and artworks. After the final scene of the evening — the entire company singing "I'm On My Way Home" — the actors answered questions from the audience. Many of the men spoke about the illustrations they drew for the backdrop (seen in the photos above). While some drawings were highly specific (a particular instrument, an exact road), one was memorably vague and searching. "I don't know what's going on," one actor said, looking up at his illustration. There was kind laughter at his admission, then quiet. "There's a transformation happening," he continued, his head turned toward the backdrop. "It's abstract. Something's being formed. And I hope it's good." Prison Performing Art's Board President, Winston Calvert, is recognized as a "Generation Now" leader in St. Louis Magazine's November 2013 issue. Honorees were selected as being "young movers and shakers who inspire and exceed the meaning of being a St. Louisan." Congrats to Winston and all the other leaders recognized in this meaningful feature. Want to learn even more about us? Follow us on Facebook today.